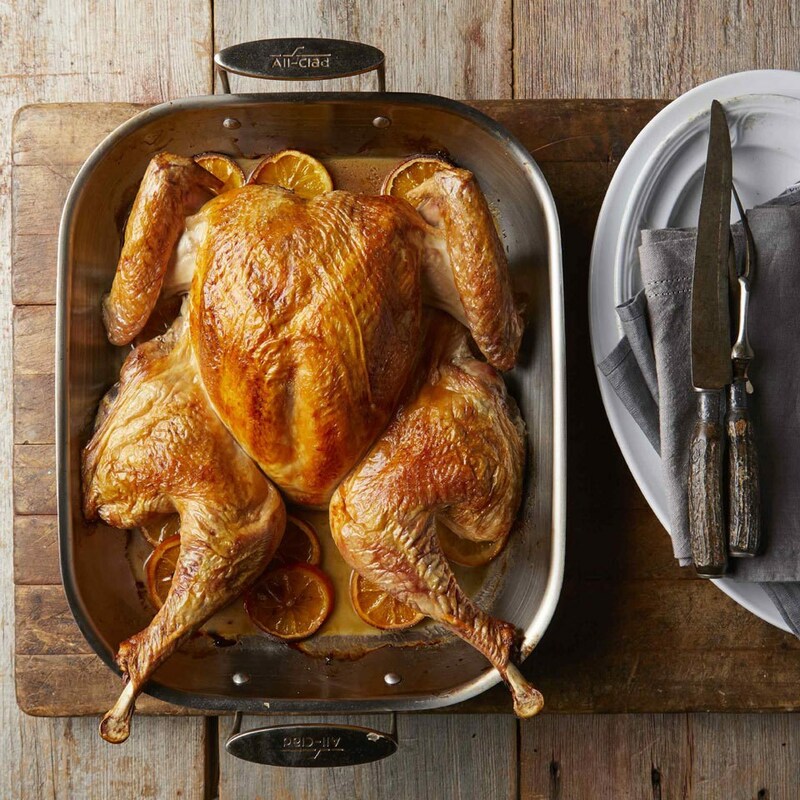 Brining is a classic way to prep roast turkey for the oven. 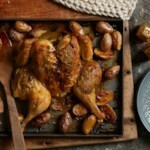 It infuses the meat with so much flavor from apple cider, celery, onion, oranges and fresh herbs. Spatchcocking is the technique of removing the backbone of a turkey or chicken and pressing the bird flat. 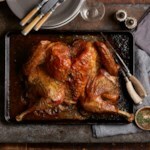 It's a convenient way to speed up the roasting time and it results in evenly browned, moist turkey. To brine turkey: Heat 3 cups cider, salt and sugar in a large pot over medium-high heat, stirring, until the salt and sugar dissolve completely. Remove from heat and stir in the remaining 2 cups cider, ice cubes, celery, orange pieces, onion, juniper berries, sage and bay leaves. Remove giblets from turkey (reserve for giblet broth, if desired). 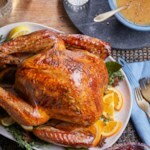 Place the turkey in a container large enough to hold it and the brine, such as a clean 5-gallon bucket, similar-size clean cooler or brining bag. Add the cider mixture, water and wine. Place a plate on top of the turkey, if necessary, so it stays below the surface, or add enough additional liquid to make sure the turkey is mostly submerged. Cover and refrigerate for at least 1 day and up to 2 days. To roast: Preheat oven to 450°F. Remove the turkey from the brine and pat dry. Trim any excess fat from the turkey. 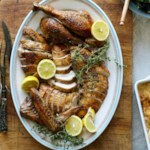 Using heavy-duty kitchen shears or poultry shears, cut the turkey down one side of the backbone, through the ribs. Make an identical cut on the opposite side to remove the backbone completely; discard or reserve for making broth. 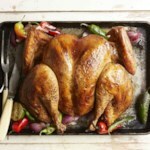 Place the turkey cut-side down and flatten with the heel of your hand (you'll have to press hard!). Splay the thighs outward and tuck the wings under. Layer the sliced oranges in a large roasting pan. Set the turkey on the oranges. Roast until an instant-read thermometer inserted the thickest part of the breast and innermost thigh registers 165°F, 1½ to 2 hours. Transfer to a large, clean cutting board and let rest for 20 minutes before carving. 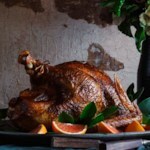 To make ahead: Brine turkey (Steps 1-2) up to 2 days ahead.